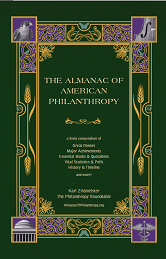 The Almanac conveniently encapsulates the history, purposes, effects, and modern direction of private giving. It lends missing perspective, and serves as a handy encyclopedic reference. People serious about donating money to good causes will consult it again and again as they refine their giving. 1909 Eliminating Hookworm in the U.S.
1966 Avery Brundage Brings Asian Art to the U.S.
1946 Rockefeller Keeps the U.N. in U.S.